A Quantum Chromodynamics QCD Site - quantum physics - Ingeneza - primordial genetic information in a snowflake. A Quantum Chromodynamics ( QCD ), Superstrings - Ingeneza - Primordial Genetic Information. INGENEZA by Tadeusz Teller (Copyright 1994 - 2016). Life, brain and mind, quantum physics, DNA, snowflakes, genetic, atoms, nucleus, quark, gluon, meson, strong nuclear forces, crystal, crystalline, water molecule, protein, metamorphosis. Ingenues in a snowflake. Now, in an extensive search of the local universe, astronomers say they have definitively found about half of the missing normal matter, called baryons, in the spaces between the galaxies. ... If intergalactic conditions allow, snowflakes can be created with that oxygen and hydrogen! Question. What for is Hydrogen and Oxygen web, across the whole Universe? Answer. In the year 1994, the INGENEZA author introduced a hypothesis, that atoms of oxygen and hydrogen can communicate with other atoms. NOW we know, the whole Universe can exchange and process the information, using the baryon web!!! . Scientists from CALTECH discovered water 12 billion light years away. ... 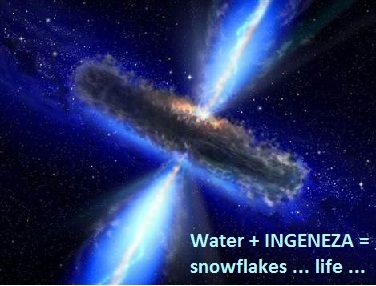 If intergalactic conditions allow, snowflakes can be created with that H2O! INGENEZA is the primordial genetic information coded with configurations of quantum chromodynamics in atom's nuclei. The essence of INGENEZA is the imperative of continuous development of the organism of the Universe, as well as the life on the Earth. Non-material INGENEZA functions integrally with cosmic matter, creating its living organism. The Canon of Beauty is a law concerning the developmental harmony of all the elements in the cosmos, including protein life on the Earth. "The following text explains basics of my hypothesis - originally published in 1994 in a book by The University of Wroclaw, Poland." INGENEZA is the primordial "genetic information" coded with configurations of quantum chromodynamics (QCD). INGENEZA is the primordial genetic information contained in every atom. INGENEZA is coded with specific sets of configurations of the elementary particles in atom's nucleus. Atoms contain, carry and transform INGENEZA(information). In this treatise a hypothesis concerning the cause of the harmonious development of the cosmos is presented. It arose as a consequence of the synthesis of knowledge obtained from different areas of science with the cooperation of scientists from a number of Universities. In light of this work the Universe appears to be much more complete and beautiful than previously expected. Starfish .... What does control creation of six arms? INGENEZA --> In-Geneza --> creation and interactions (controlled) from the inside. Chaos does not mean disorder - chaos is the "primordial order". The discovery concerns existence of a primary (original) information, encoded in atoms, and called - Ingeneza. This discovery is possible due to earlier works on the uncertainty in atom's quantum mechanics, researched by many in the 20th century. 1. Primary (original) information acts in the Universe - Ingeneza - the imperative of the development (evolution) of the Universe and life on the Earth. Ingeneza, as a non-material phenomenon, has no mass, and its logons (quants of the development logic) can be carried with photons at the light speed, similar way as a radio carries human's information. 2. Ingeneza is carried inside atoms. The energy and mass of atoms i made of superstrings. 3. The logons of Ingeneza are coded with an "alphabet" of the superstrings sets, inside the atom's nuclei. 4. Atoms have been created having a micro-equipment, with the computation and execution power of unsurpassed quality. Ingeneza uses the micro-equipment to work creatively with the energy of photons (superstring quantum) and electromagnetic morphogenetic field (EMMF). 5. In a macro scale, Ingeneza uses the crystalline equipment, build with atoms. Ingeneza controls photonic interaction between atom's electrons and EMMF. 6. Photons carry quants of a program and quants of energy - the force and the development cause. 7. Multi-dimensional uncertainty of the atom's quantum mechanics allows for multi-dimensional development of the life on the Earth. 8. Ingeneza creates quants of the beauty (beauty quantum). Quantum of the Ingeneza's actions are harmonized, and together they create functional structures, beautiful shapes, colors, fragrances, etc. 9. Ingeneza works in the crystalline structures of the brain. Ingeneza, inside the brain's atoms, works with information, converts visual sensations, smell, sound, and others into its own (Ingeneza's) superstring "alphabet", and then, converts into movements, instincts, intuition, mind, verbal expression, etc. 10. Atoms have memory! That memory allows DNA to have its own memory. Also, our brain's memory is based on the atom's memory. INGENEZA is essential to the thinking of each human being. 2. Proofs of the Works of INGENEZA - Coded in Atom's Nuclei. Why snowflakes don't look like that? Answer - Ingeneza and Canon of Beauty prefer symmetry and harmony in the works. The essence of life is tied to quantum chromo - dynamics. In-betwean many other proves, the most obvious one is a process, where Ingeneza controls building of a snow flake. 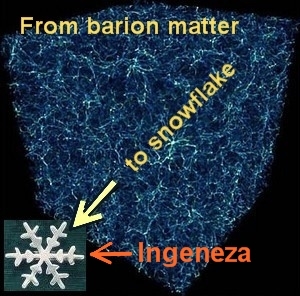 Due to "uncertainty" in the quantum mechanics, Ingeneza can execute an abrupt program to build fascinating and functional shapes of the snow flake, which is not repeatable. Figure 1. Un-repeatable Snowflakes, by W. A. Bentley and W. J. Humphrey, Publications 1962. The H2O crystals play various functions in the common organism of the Earth's nature. In the winter time, a layer of fresh snow flakes, covers forests, meadows and fields, and provides a thermal protection the same way the feathers work for a bird. The crystallized structure of a snow flake is of hexagonal rings type, as opposed to rectangular ones in the ice. The hexagonal structures can perform cybernetic functions, the same way the clusters of atoms (rings of atoms). During the crystallization process, of a snow flake structure, chemical contamination is expelled. That allows for embetterment of the Ingeneza works, building a snow flake. Figure 2. Crystalline structure of a snowflake. Figure 3. 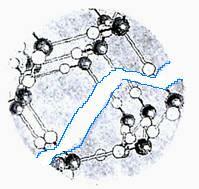 Crystalline structure of adenine and thymine in DNA. To make easier to understand Ingeneza, I would like to ask a question - where from does each branch of the snow flake knows what shape it should take? 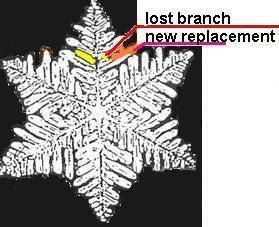 Why a snow flake is not forming as shown in figure below? Figure 4. Artificial - non existing - snow flake. The answer is in Ingeneza and Canon of Beauty - the symmetry is preferred. Every living tree has the shape of a leaf programmed in the DNA atoms. A snow flake has no DNA - where from is the shape of the snow flake? Figure. 5. Tri leafed snowflake . Figure. 6. Six-leafed snowflake and cyber-executive equipment. Answer - the source of the program is the oxygen atom Oa, positioned in the center of the symmetry - see figures 5 and 6 below. Ingeneza in Oa projects the snowflake shape, with sets of of superstrings (in atom's nuclei). The bits ("quants") of the projects are carried from neutrons to protons with mesons. Protons use electrons and photons to carry the project to the "workshop" - atoms Ob. The design of a snowflake, employing rings of superstrings) can be compared to structural drawings of a building to be built. Bricks and mortar is moved with hands of a laborer - snowflakes are built by Ingeneza. mind = ingeneza and hands = quants of energy. Ingeneza, encoded in the Oa (alpha) oxygen atom, starts with the cyber-executive equipment, which is needed to progress building of a snowflake. One of the key elements is the electromagnetic morphogenetic field (EMMF) with axis of symmetry. The tri-leafed snowflakes are built with the cyber-executive equipment, consisting of three hexagons of H2O. The 6-leafed snowflakes (with 6 axes of symmetry) are built with six hexagons. The initial cyber-executive equipment can contain millions of rings of crystaline-like structures. The EMMF is the key tool for Ingeneza. The EMMF is generated around a single photon, making it a node of that field, as well as around electrons, atoms, crystals, DNA molecules, and microscopic elements. EMMF has no mass, however, it is an existing phenomenon. Excited EMMF is the tool for shaping material structures in a macro scale. In every point of the EMM field, the electromagnetic forces interact with electric and magnetic fields in H2O, while a snowflake is built. Every molecule interacts with the field and it moves to the designated position. At that new position, a surplus of the energy creates another local node, which attracts or expels next H2O molecules, as requested by Ingeneza with photons ("empty" photons, as the quants of energy, go back to carry next instructions). There are six types of EMMF vectors, in the nature. Four of them are of electromagnetic types: electric field, electric induction, magnetic induction and magnetic field. The fifth vector is time. The sixth one is gravitation. The Ingeneza programs realizes a snowflake perpendicularly to the gravitation field. The vectors are inter-tangled, and Ingeneza must control and harmonize all of them, creating incrementally (steeply - non linear) changes to the algorithms of interaction, in a Cartesian space of that field, where the snowflake grows. The prove that Ingeneza can control uncertainty of the quantum mechanics is the final effect of the works - a snowflake. 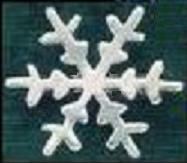 Consecutive and non-repetitive algorithms of EMMF are coded with definite steps (abrupt), allowing to build unique H2O frozen structures, which are functional and can help with a peaceful float of a snowflake in the air. The frozen H2O can serve another functions in the nature - what is not elaborated in this treatise. Colors show cosequecutive algorithms of the shapes. Careful analysis of the snowflakes, built with 6-hexagonal equipment, allows to see the opposite branches have different shapes. The variations are due to time differences needed to build branches, as the number of needed atoms is different - see Figure 8 below. Figure. 8. Difference in distance. cyber-executive equipment, from the Oa "designer" atom to the Ob "workshop" atoms, starting new axes of the branches. As it is shown in Figure 6., the 6-branched snowflake has eight (8) atoms or six (6) atoms from Oa to Ob, depending on the path. That difference causes two distinct time delays, needed by the logons of Ingeneza to travel with new order to attach next atom. The time difference ratio is 8:6 = 1.333... The same ratio applies to the branch length, what can be measured and calculated - see Figure 8. It needs to be noticed, Ingeneza uses the opportunity to expedite the "job" of building the whole snowflake, by ordering the faster growing branches to cooperate with the slower ones, and filling-in the empty space, "belonging" to the slower ones. Also, multiple "rings" in the snowflake structure mitigate the grows difference. All of that means, Ingeneza is absolutely capable controlling the "uncertainty" in the quantum mechanics of atoms. The discovery of Ingeneza confirms the intuitional expression by Albert Einstein, who said, while analyzing the Schroedinger/Heisenberg's uncertainty theory: "God does not play dice" (with the Universe or atoms). Soon after that he has formulated the photon hypothesis. The uncertainty is the essence to the Ingeneza works, and nothing in the atom happens on itself, as it was speculated earlier with the Schroedinger/Heisenberg's uncertainty theory. At that time, the science was advanced enough to discover Ingeneza, however, for the scientists the Darwin's theory of evolution has overshadowed the existence of Ingeneza. Now, we discover, that the photons - nodes of EM waves - can carry quants of a development program - logons of Ingeneza. The photons can indirectly force very deterministic transitions in the "uncertain" actions of quantum mechanics, and, Ingeneza can create in definite steps the snowflakes, as well as living organisms. Ingeneza is capable running mathematical calculations. One of the easier to observe a phenomenon is regeneration of broken branches, what requires accurate calculations to recover symmetry and balance of a snowflake. FIgure. 9. Simplified regrowth example. Figure. 10. Regrowth in a snowflake. Figures 9 and 10 show intentional regeneration of the structures in plant branches and snowflakes. The functions of lost branches are taken by new regrowth started at the nearby branches. Figure. 11. Photography of a tree branch and snowflake branch with damages - repaired damages. The adjacent branch fills in the empty space, after a small piece is lost. Figure. 12. 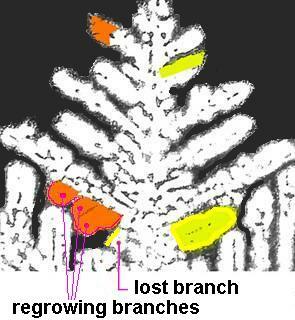 Example showing the regeneration of broken branches. Figure. 13. Broken hexagonal structure. The local EMMF is discontinued, and in that place a new branch can not grow. Therefore, Ingeneza initializes growth from other place, where the EMMF is continuous. A broken branch is causing breakage in the hexagonal structure of atoms, and local interference with EMMF. In that very place new branch can not grow. Ingeneza initializes new growth from adjacent branch. DNA can not function without INGENEZA!!! Ingeneza can build its own tools allowing for more complex creativity. The ultimate tool is DNA ! DNA is build with five elements: oxygen, carbon, nitrogen and phosphorus. Atoms of all those elements communicate Ingeneza's instructions, with a large spectrum of frequencies (wave length). The ability to communicate across the whole structure allows for accelerated and abrupt creation of new species, starting from viruses, bacterium, up to humans. The abrupt creation of new organs in new species, allows to expand to new environments. Now we know, that the non-coding DNA, also called secondary DNA, or junk DNA contains Ingeneza. The atoms in that part of DNA are the key to the enormous ability of DNA to re-create the life. Those "junk" atoms increase the cyber-executing equipment of Ingeneza, and indirectly DNA. DNA can not function without Ingeneza !!! DNA can not function without atoms being able to communicate, computate and memorize !!! Today, we can observe how thousands of living organisms, for example caterpillars, convert abruptly into butterflies. The same way, some times ago, primary apes started abruptly converting into humans, safe - because inside the wombs. ALL of that possible, only, because of Ingeneza! Living in the soil, Myxomycophyta endangered by a drought, can group together creating one higher-level organism (by Strasburger). Fig. 14. Development of Myxomycophyta (works of Ingeneza). Living in one ecological domain, abruptly converts to a butterfly living in totally different environment. Metamorphosis can be reversed in next generations, or un-reversed - stable. See Figure 8 for explanation. Fig. 15. Caterpillar -> chrysalis -> butterfly (works of Ingeneza). Fig. 17. Reptile egg -> reptile -> irreversible metamorphosis - first bird. Figure 9. Examples of Metamorphosis (works of Ingeneza). New species were created during a life cycle of a single generation - works of Ingeneza. 1. In the Universe, together with energy and matter, exists and works Ingeneza. 2. Atoms are not creations of a chance or natural selection (Darwin). Atoms are crated as a cyber-executive equipment, with encoded Ingeneza (inside atoms). Atoms and Ingeneza can encode genetic information in DNA, as well as our brain and instincts. 3. Discovery of Ingeneza, coded in every atom, explains the very existence of quantum mechanics and "unexplainability" of the quantum mechanics., what is the must for the life to exist. 4. Discovery of Ingeneza requires to correct (erred) findings of a variety of sciences. For example: textbooks for biology says only 2 % of DNA is useful, and the rest is a unwanted ballast. Those "dormant" segments of DNA contain Ingeneza in large quantities, enough to build the life. That can be compared to a couple of workers making bricks to build a home. Are those two guys only needed to erect a building?!?! Are bricks moving to the right position by themselves? What about engineers, designers, laborers, management, investors, delivery, etc. It is just opposite: all atoms in DNA use Ingeneza to build a life. The 2 % of DNA - the "active" one - is subordinated by the whole DNA. The orders are generated with all atoms. Each group of atoms (segments of DNA) have the "knowledge" encoded inside them, for example - how to build a retina in the left eye. The knowledge is sent with zillions of quants to the proper executors, in a very precise moment of time. In living organism, on much higher level, information is transported with blood, lymphatic system, lipids, however, at the base level, Ingeneza is the stimulus of the creation. "God's word" could be = "Ingeneza". The creator of Ingeneza employed superstrings, quantum mechanics, quantum uncertainty to crate the "word". We have achieved the harmony between the science and religion. That target has been pointed by Pope Paul II, who pointed to "the mutual position of scientific knowledge and faith", during a speech at the European Physical Society, on March 30, 1979. The science has reached the microcosm of superstrings, quantized for Ingeneza, and superstrings not quantized yet, making the "soil" for the development of the cosmic galaxies. I would like to thank to scientists, who cooperated on my research, from the University of Wroclaw, the Medical Academy of Wroclaw and the Polytechnic of Wroclaw, also the Jagiellonski University in Krakow. Consultations and critical analysis were done free of charge by scientists from the those institutions. Financial help, in issuing my book, was provided by the University of Wroclaw and by Hutmen in Wroclaw. The Ingeneza hypothesis was created in 1993 and published in 1994 by the University of Wroclaw ("Czlowiek, Kosmos i Kanon Piekna", ISBN-83-229-1106-8, Wydawnictwo Uniwersytetu Wroclawskiego, 1994). Work on Ingeneza took a significant part of my life time. I would like to thank those who gratuitously helped me to reach my goals. Particularly, I would like to thank to my family, which patiently suffered my spiritual absence in their daily life. My family helped me on the merits of the research, and also financially. Economic down-turns and recessions in my country prevented me from finding sponsors to continue my work. However, I am optimistic, that one day sponsors allow me to propagate this controversial thesis across the whole World. Tadeusz Teller, "Czlowiek, Kosmos i Kanon Piekna", ISBN 83-229-1106-8, Wydawnictwo Uniwersytetu Wroclawskiego, 1994. The first time on an Internet server in Sept. 2001. Last edition - December 2016. Copyright 1994, 2001- 2016 by Tadeusz Teller and Witold Teller. Tired reading about quantum physics? Take a break and have a look at artistic photography.